Does your business belong to the chemical processing industry? Does your business manufacture products for the chemical processing industry? If so, you might consider utilizing N08904 stainless steel, also known as alloy 904L. N08904 stainless steel is one of the most popularly used resources in the chemical industry. Questioning why N08904 is so popular in the chemical industry? Looking for some specifics on its characteristics and functionality? Read on! What Chemicals are Typically Processed with N08904 Stainless? N08904 stainless steel can play nice with a variety of different chemicals. However, there are specific chemicals which it is most often used to process. These chemicals include sulfuric acid, phosphoric acid, organic acid, and inorganic acid. Sulfuric acid is used primarily in the production of fertilizer. However, it can also be used in the manufacture of dyes, soaps, medications, and other chemicals. A highly-corrosive acid, sulfuric acid can wither away some metals like a knife through butter. N08904, fortunately, can withstand its corrosive effects. Consisting of large amounts of sulfuric acid, phosphoric acid serves many practical purposes. Not only does it serve as an ingredient in fertilizers, it also works to remove rust. Not to mention, it can be used as a food additive and a medication ingredient. In anything more than trace amounts, phosphoric acid is extremely corrosive. Many stainless steel alloys cannot withstand the corrosive properties of phosphoric acid. N08904, however, can. Organic acids (citric acid, acetic acid, etc.) are used primarily in the production of food. You’ll find them in vinegar, pop, tomatoes, and other foods which have a bit of a bite to them. Like sulfuric and phosphoric acid, organic acid is corrosive to many metals. Alloy 904L, however, can withstand the corrosive properties of the substance. Inorganic acids such as nitric acid and hydrochloric acid are used in a range of industries. Not only are these acids used to produce batteries, but potentially toxic chemical mixtures such as toilet cleaner as well. Highly-corrosive, they can burn through some metal alloys in no time. Fortunately, N08904 stainless is not one of these alloys. It can withstand inorganic acid corrosion with ease. Why is N08904 Stainless Steel Used for Chemical Processing? N08904 stainless steel is used for chemical processing because of two primary characteristics. One of these characteristics is excellent resistance to corrosion. The other of these characteristics is an ability to be formed and shaped. The primary reason that N08904 stainless steel is used by the chemical processing industry is that it’s highly resistant to corrosion. 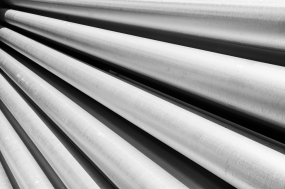 One of only a few stainless steels which can provide a high degree of resistance to sulfuric acid at 95 degrees fahrenheit, it’s also resistant to a range of other chemicals. These chemicals include all of the chemicals reviewed above. Some steels provide top-notch corrosion resistance, but are not malleable enough to be formed into needed shapes. N08904 is not one of these steels. In addition to being very malleable, N08904 is also extremely weldable. This allows it to be formed into a variety of different components, many of which are used in the chemical processing industry. These components include tubes, valves, and pumps, to name just a few. Looking for N08904 Stainless Steel Products? Do you have a need for N08904? Looking for N08904 stainless steel products? Great Plains Stainless is the company to call. We offer a wide variety of N08904 stainless steel products. These products include bars, tubes, pipes, plates, flanges, and much more. Check out our selection of N08904 stainless steel products now!